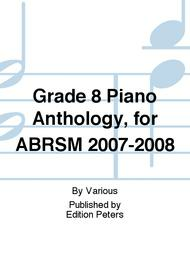 Contains a broad selection of music from lists A, B, and C of the Associated Board's 2007-2008 Piano Syllabus. Includes performance notes by Norman Beedle, Professor of Piano at the Guildhall School of Music and Drama. Features Aural Notes by Caroline Eva. Composed by Various. 3A. Edition Peters #EP7878. Published by Edition Peters (PE.EP7878). 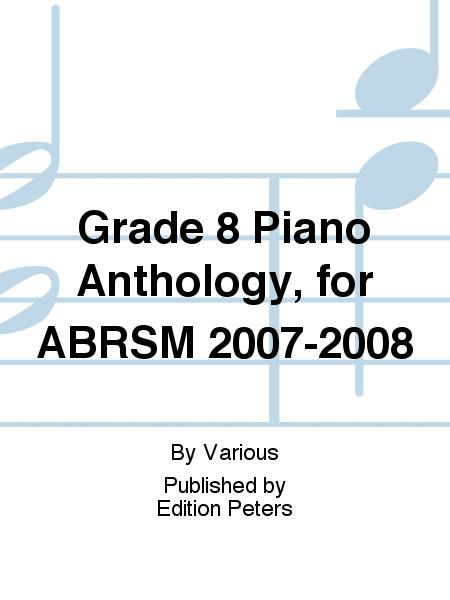 Grade 8 Piano Anthology, for ABRSM 2007-2008 - Contains a broad selection of music from lists A, B, and C of the Associated Board's 2007-2008 Piano Syllabus. Includes performance notes by Norman Beedle, Professor of Piano at the Guildhall School of Music and Drama. Features Aural Notes by Caroline Evans, author of the Aural Test Survival Books. - J.S. Bach: Prelude and Fugue in Ab, BWV 862 (from the Well-Tempered Clavier, Book 1); Scarlatti: Sonata in A minor, K.175; Shostakovich: Prelude and Fugue in A (No. 7 from 24 Preludes and Fugues Op.87); Scarlatti: Sonata in E, K.46;Handel: Prelude and Gigue (movements I and IV from Suite No.6 in F sharp, HWV 431); Mendelssohn: Prelude and Fugue in D, Op.35 No.2; Haydn: Movement 1 (Allegro) from Sonata in Eb, Hob. XVI/52; Schubert: Allegro moderato (movement 1 from Sonata in Eb, D.568/Op.122); Mozart: Allegro con spirito (movement 1 fromSonata in C, K.309); Clementi: Allegro con spirito (movement 1 from Sonata in G minor, Op.7 No.3); Beethoven: Adagio cantabile - Allegro ma nontroppo (movement 1 from Sonata in F sharp, Op.78); Beethoven: Allegro vivace (movement 1 from Sonata in G major, Op.31 No.1); Haydn: Allegro (movement 1 from Sonata in C major, Hob. XVI/50); Mozart: Allegro (movement 1 from Sonata in Fmajor, K.332); Ravel: Mouvement de menuet (movement 2 from Sonatine); Chopin: Nocturne in F minor, Op.55 No.1; Debussy: La serenade interrompue (No.9 from Preludes Book 1); Grieg: Notturno, Op.54 No.4; Brahms: Intermezzo in E major (No.4 from Seven Fantasies, Op.116).